I had been intending to make this dress from the moment the contest was launched. I say from then because, the previous day when the dress was launched I was very underwhelmed. You see it was another dress - I had just made two Laurels. It was a dress that looks like it would need ironing, had aprox 1000 buttons and I've never worn a shirt dress in my life - well they never fit in the shops so I've never bought one. So when the contest was announced it was my competitive side that made me buy the pattern. So the pattern sat on my computer waiting for me to download it whilst I busied myself with finishing off a few other projects and generally avoiding it. Anyway last Friday I remembered that it needed to be made before Sunday and so went fabric shopping. I had been looking online and had seen some lovely fabric - a violet chambray, a blue cherries and flower print, purple gingham and a multicoloured seersucker plaid but had not got round to ordering them so fabric shop on the way home it was. It was 20 minutes before the shop closed and so I rushed around like a crazy lady trying to find the most fabulous fabric. I had vowed to stay away from anything where the pattern would need to be matched so imagine my surprise on returning home to have bought grey, black and blue cotton plaid - puzzled look??? I then went camping for two days - on my return and very sleepy- i decided to start the dress; and whats more set about completing it in time for the contest, well it finishes PST so there was plenty of time. I printed it out, stuck it together and cut it out and then set about cutting out the fabric. I have never liked this bit so tried using cutting mat and cutting wheel instead of shears. Not sure if its a combination of the cotton and the wheel but the finished pieces looked really like the template. My confidence increased and so I set about making the dress. 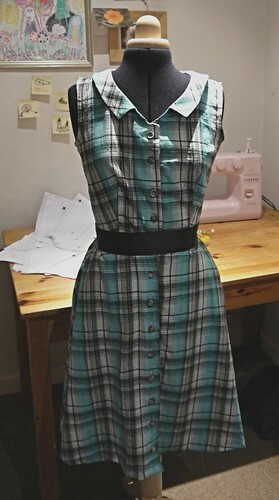 Using both the sewalong tutorial and the pattern instructions it was a breeze and when I finished for the day (3am) I had completed the collar and the bodice and just needed to attach the skirt and buttons. I woke up at 8am and started again. Trying to be quick I made two mistakes when attaching the skirt pieces together and attaching the skirt to the bodice which both had to be carefully unpicked and sewed together again. Both involved not checking before sewing. Seams showing on the outside is not a good look. Well that just left the buttonholes and buttons - The sewalong suggested looking at the manual for my sewing machine, I had lost this so practised with a scrap of felt until I had mastered it. I am very proud of the buttonholes - so neat. Then there's the slow process of sewing on the buttons and the hem. So all in all the dress took 24 hours - well 19 if you take out sleeping. I mentioned at the beginning that I don't own any shirt dresses and I think I know why now. Like all shop bought clothes it is made for an average person and I am not average. 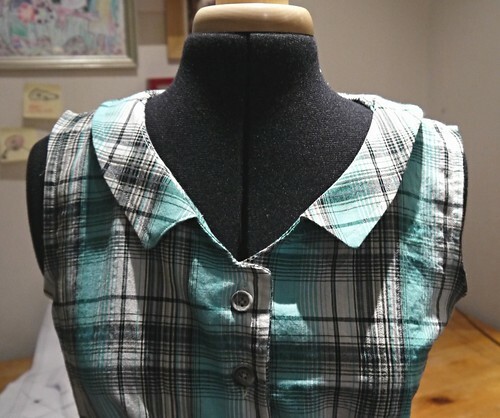 My body shape does not have any very obvious places where adjustments would need to be made but on shop dresses the buttons around the bust would be pulled too tight or in the next size up the back would not be fitted. I did not do a FBA but I did take the seams out on the sides from 5/8 to 1/4. Also shop dresses are straight cut and not the beautifully flattering circle skirt. This shape skirt is very practical to move in yet very feminine to. How do I feel about my dress? Well i love it!!! its a perfect combination of 50's housewife uber femme and grungy 90's throwback. Also perfect camouflage when picnicking. 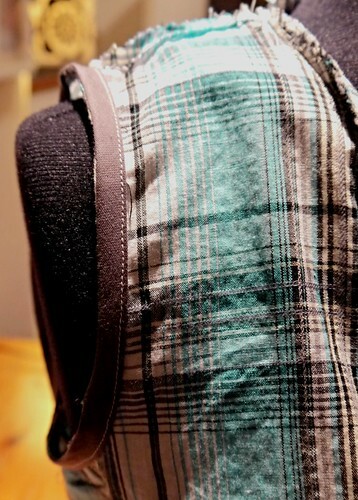 I am also very proud of the attention to detail and how far i have come since January when i started sewing clothes. Thank you Sarai for pushing me out of my comfort zone each time and supporting me with brilliant patterns and tutorials. UPDATE - It didn't make it through to the second round - sad face. But I still get to wear it and wear it i shall. I love this pattern and |I am already planning on making some new ones. 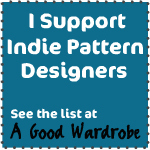 Also if you haven't already go place your votes there are some beautiful versions out there and some great inspiration if you've not yet made this pattern. Oh and feel free to leave a comment too. Your dress looks great! And I am amazed at how quickly you made it.